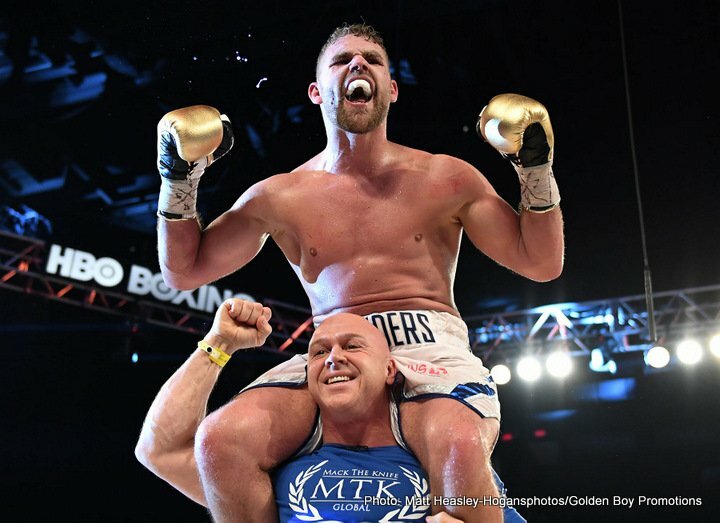 So what next for reigning, undefeated, WBO middleweight champ Billy Joe Saunders? 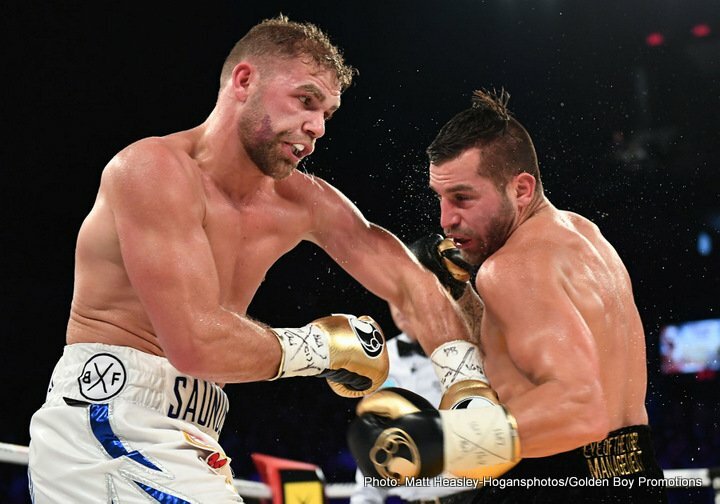 With last night’s hugely impressive display in totally outclassing a dangerous David Lemieux, a fighter Saunders defused, the gifted southpaw certainly put himself in a great position. 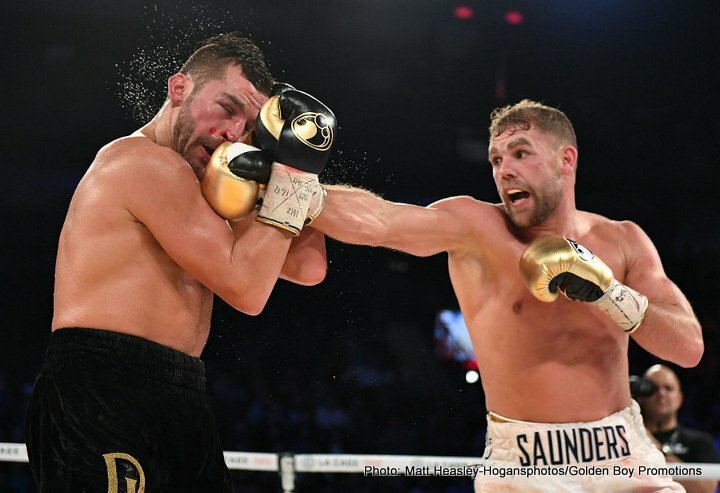 Saunders cannot be ignored by the elite of the elite any longer, and it seems the big fights with either Gennady Golovkin or Canelo Alvarez, or maybe even both, will have to come. Speaking after last night’s terrific win in Canada, Saunders and his promoter Frank Warren cast an eye over the immediate future. Saunders, who called GGG out when speaking earlier with Max Kellerman, actually said to Box Nation how he fears his great performance against Lemieux will “scare them off. “ They [GGG and Canelo] won’t want to fight me now,” he said. All the same, the target, the ultimate goal for BJS is the winner of the expected return fight between world ruler Triple-G and the Mexican superstar. Warren said last night that he has been told the sequel to the September draw is close to being announced, in the next week, and that it will likely go ahead in May of 2018. “So we’ll have to wait, probably until September,” Warren said. The plan in the meantime is for Saunders, 26-0(12) to fight in the spring. “He has to fight and remain active,” Warren said. In a very interesting scenario, one that would prove satisfactory to fight fans, the GGG-Canelo return would indeed go ahead in May, over Cinco de Mayo weekend, and the winner would then challenge Saunders for his WBO belt in what would be one massive middleweight unification showdown. BJS can keep his formidable tools sharp in an April fight with, say, Danny Jacobs or one of the other top contenders at 160……if he can find any top contenders who are willing to fight him, that is. For as good, as special, as tough to nail down as he looked last night, Saunders may well find himself being avoided. Jacobs, who predicted a Saunders win over Lemieux, is ranked by many as the best middleweight in the world behind GGG and Canelo – or at least he was before last night. Is Saunders now the proven best 160 pounder in the word behind GGG and Canelo? He very arguably is. Now all BJS needs is the chance to prove to the world he’s number-one. But will the GGG-Canelo winner give him that chance? Next boxing news: The great Manny Pacquiao turns 39 today – will Pac Man fight again?